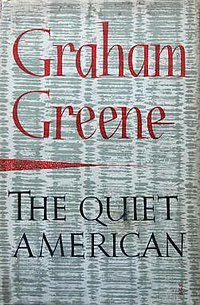 “The Quiet American” is one of those novels that, in order to truly appreciate, you’ve got to read in conjunction with a comprehensive introduction/essay that will give a clear sense of context. This particular edition actually gets the job done pretty well. But I’ll tell you what: read this novel from our current cultural moment, and this just seems like a snobby European narrator who detests America’s rise to international prominence in the 20th century. And, of course, it is that. Definitely. But you’ve got to understand that it’s trying to be that; it’s trying to truly capture the spirit of the times, the post-World-War-II annoyance at American arrogance, something that many current readers are likely unfamiliar with (though we seem to be very aware of the 2000s-era annoyance at American arrogance). So if you decide to check out “The Quiet American,” make sure that you understand the context, or this could prove to be an underwhelming read. And…well…it will still be an underwhelming read, regardless. To be completely honest, it’s a book that might be integral to literary history (and particularly, British literary history), but feels emotionally detached, and–despite a brilliant use of a first-person retrospective narrator to keep us engaged in the present moment, and in the backstory–a story that seems empty of tension. Even when we are supposed to feel danger, we don’t, because–although we do feel for the tragic character of the American, Pyle–we never really feel much attachment or sympathy for the British narrator. As I mentioned above, he comes across as a snob, as callous, as uncaring, and since we know from the start that he survives the book and Pyle does not, we hope that he’ll either come to a tragic end, also, or that he’ll change. In the end, when he does not, we’re simply left with a narrator that we’ve never cared about…and so we’re absolutely fine with putting “The Quiet American” back onto the bookshelf, and never really touching it again. “The Metamorphosis” was one of those books that I was forced to read in high school, and that I sped through in a single weekend, expecting or hoping for it to be like a best-seller, like “Alien” or “The Fly” on the printed page. When I saw immediately that it wasn’t written with Stephen King or Dean Koontz excitement or urgency, I became disappointed…then read it looking for buzz words, answers to the coming quiz or test in my AP English course. That’s how most high schoolers read, I suspect, and it took awhile before I realized that there are so many different ways to read a text, and that my experience in reading some of the most important works of world literature was weakened by the attitude that I was reading “an assignment” and not “something fun.” The experience is ruined for millions upon millions of readers, and probably has a lot to do with the way that most teenagers and 20-somethings view books in general, and why so many potential readers decide upon other leisure activities, or shy away from books forever. All that said…I recently decided to re-read a few of the books that I hated from high school (and also created a list of some of the books I’d avoided because some other high school friend had griped about them). When I re-read “Heart of Darkness,” I was absolutely blown away. How was it that I couldn’t remember a single sentence of this book? How was it that I’d read this entire novel with a grimace, that I’d told friends for many years that it “sucked?” Conrad’s work–perhaps because I now understood the context so much better, and perhaps because I expected and appreciated the density of the prose, rather than hoping for some dialogue-and-action-heavy “Da Vinci Code”-style action/adventure story–suddenly came alive, and I was embarrassed for ever having dismissed it. The same, however, was not true of James Joyce, whose work (a decade later) still felt flat and joyless. I decided to read each story slowly. Take my time. Pay attention to the prose. This would not be a labor, but an appreciation. And I would read the introduction (something I always do with world literature now, and something I always avoided when I was a high schooler…now I absolutely crave the context). And I would wait awhile before truly formulating and articulating my thoughts. Let it marinate. Was Kafka important to the development of world literature? Sure. I’m still not exactly certain how. Maybe in the same way that “The Blair Witch Project” showed how ridiculously CGI-heavy Hollywood had become, and that sometimes gritty and intimate are better? I don’t know. His work definitely re-defined the standard ideas of plot and character, as Kurt Vonnegut discusses to comic effect in “A Man Without a Country.” But still…as I was reading, I just didn’t care about the characters, about the situations, about the language. Often, it didn’t even feel like Kafka cared. 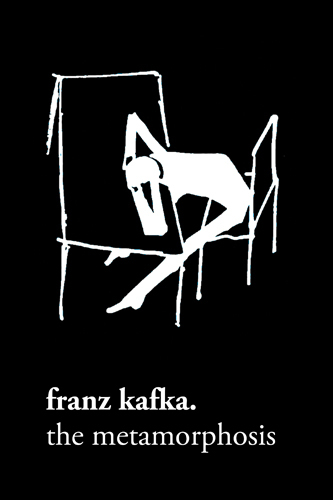 I am glad, however, that I re-read “The Metamorphosis.” I’m glad that I gave my full attention to Kafka, that I didn’t just dismiss it from the start. Whenever I write something like this, of course, there’s someone who attacks me and tells me that I just “don’t get it,” that I’m too critical, that this author/ filmmaker is a genius and who the hell am I to…blah blah blah. Listen: if you love the book, God bless you. I’m happy for you. But Kafka is like a Scotch, or an India Pale Ale, or a fine cigar…it doesn’t matter how refined you are, or how smart you are, or how well-read you are…if you don’t like it, you don’t like it. I’m always willing to try a cigar if someone else is paying, but I’ll be honest: it always just tastes like smoke to me. While Sinclair Lewis’ It Can’t Happen Here is remarkably prescient of the events to come in the late 1930s and early 1940s, and the World War II years specifically, and while some of the ideas even transfer well to the early 2000s’ post-9/11 hysteria (the passing of the PATRIOT Act, for instance, and the surrendering of civil liberties), it isn’t necessarily a great book. Lewis is a great writer, of course, and there are flashes throughout this novel of a great prose artist, but a discerning reader can certainly see that this thing was written in a matter of months. The narrative moves along so quickly, with such little regard for the shifting of perspective or for the shifting of structural strategy, that it’s easy to imagine Lewis blazing away at his typewriter, churning out pages with barely a glance at the finished product before shipping it off to his editor. The result is a protagonist who is poorly developed, who we don’t care about, and who serves only as a prop, a vehicle, for all of the political events swirling around him. He has little agency, just seems thrown about, and frequently makes or listens to sweeping political speeches that could just as easily have been editorials previously published by Lewis himself. 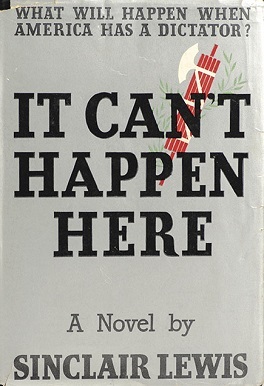 It Can’t Happen Here should join the interesting American canon of paranoid political novels (right up there with, say, Alas Babylon) because, while I wasn’t satisfied with the book as character-driven fiction, it never failed to be engaging or relevant. But to be honest, it is most interesting as an artifact, a slice of 1930s paranoia, and not as a piece of enduring literature.